Recently I emailed James Spann and a few others to get their insight on my questions. Interesting feedback was provided. I would like to do the same here as I am very interested in understanding more about what I see in the following images. This photo was taken in Beauregard. My question is, what is the red arrow most likely an indicator of? 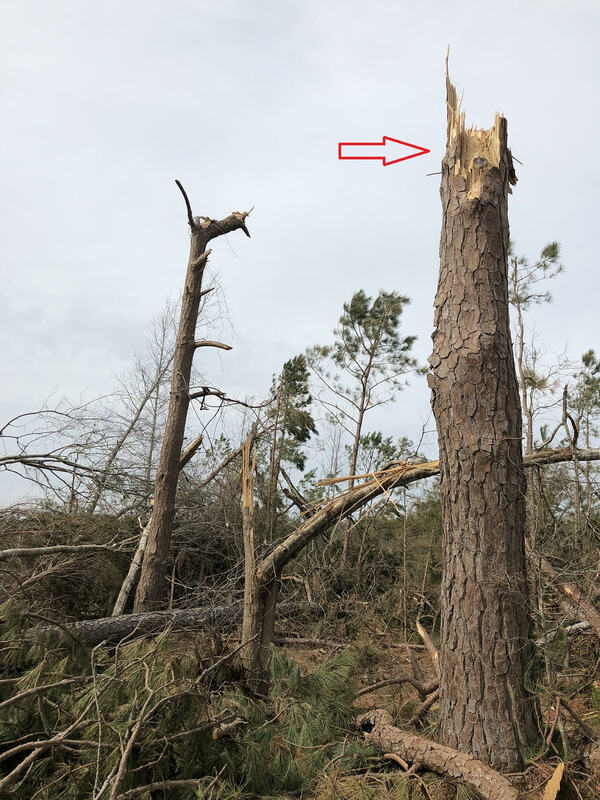 The pine tree was prob a good 3-4' in circumference, would you assume the pine tree was twisted (by swirling air) until it snapped in half, or does it appear a straight blow (by straight direction winds) occurred? It is fascinating that a tree this large and thick would snap in half either by being twisted or by a straight blow. I am curious as to what would cause one tree to snap in half, one to snap lower to the ground, etc. Is the wind speed? The wind direction? 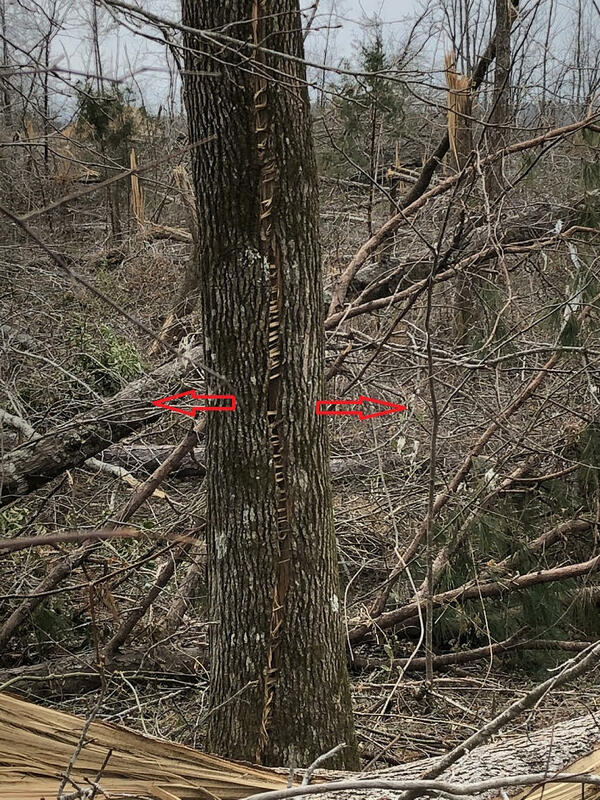 Are the trees bending as a result of the wind pulling them into the tornado after it has passed, or is it the force of the wind from the tornado as it approaches? Which is an indicator of a stronger wind, a tree being uprooted or a tree being split and splintered? Lastly I would like to give my 2 cents on the 2011 EF 4 Tuscaloosa tornado and the 2019 Beauregard EF 4 tornado in comparison to the 2011 EF 5 Joplin tornado and 2013 EF 5 Moore tornado. My opinion is that if you were to put the Tuscaloosa and/or Beauregard tornadoes in Moore and/or Joplin, they most likely would have been rated EF 5. I believe that the number of trees and the density of the forests that we have in Alabama vs OK or MO is what contributes to some structures (homes, etc.) not being "swept" from their foundation as we often see in OK. It is my opinion that there is some bias as to the traditional tornado alley (i.e. more likely to receive an EF5 rating) vs Dixie Alley (less likely). 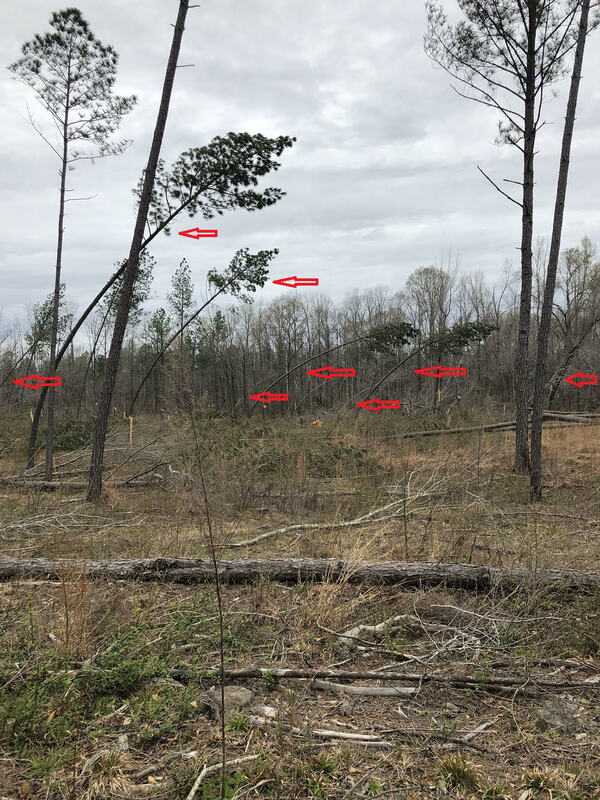 When I think back to the 1998 Oak Grove, AL tornado (my friend at the time lived in Sylvan Springs, AL and her house was significantly damaged) and the images I remember, I see similar if not the same images in Tuscaloosa (2011) and Beauregard (2019). I remember driving down Warrior River Road through Rock Creek (1998) and driving through Concord (2011) and recently through Beauregard (2019). Difference? Tornado rating in 98 (F5) vs 2011 (EF4) vs. 2019 (EF4). I am curious what parameters are used to designate an EF rating. 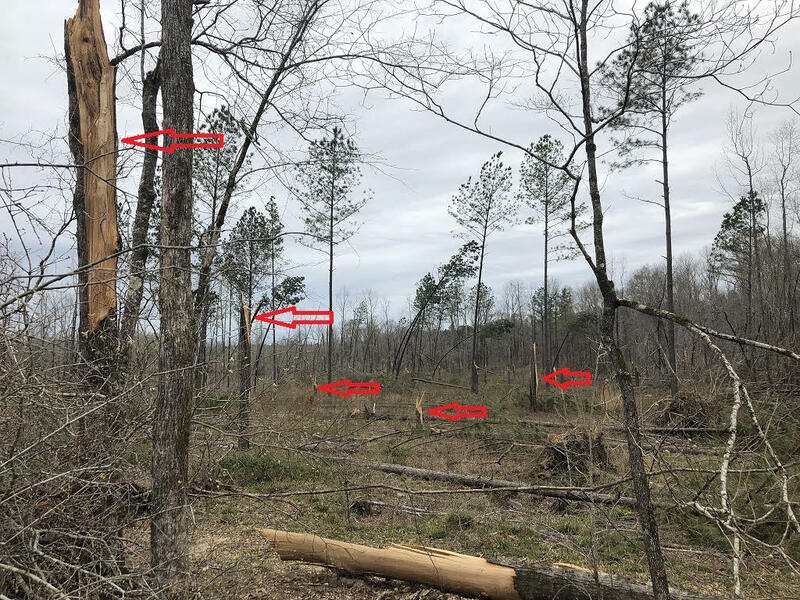 I am curious if the storm damage survey teams take into consideration the effects of having a hundred trees in your background (AL) vs. having virtually no trees in your backyard (OK), etc. The terrain (hills vs. no hills) and how that can effect the manifestations of wind direction, the anatomy of the tornado, etc. I think for some people who live in these areas it might appear to help cope with the tragedy if the validation of the significance of the tragedy was represented. Of course I understand the latter is very subjective. In the grand scheme of things, I realize it is irrelevant the EF rating when your home has been destroyed and your community has been destroyed. However for the purposes of discussion, I would like to know what yall think. Hi Justin! I like the where this post is going but it looks like the images didn't make it into the post. The thing about trees is that their branch and foliage loading is usually asymmetrical, sometimes highly, which can make their wind damage patterns highly complex. Sometimes even a straight wind will cause severe twisting if there is more foliage/branching on one side than the other. 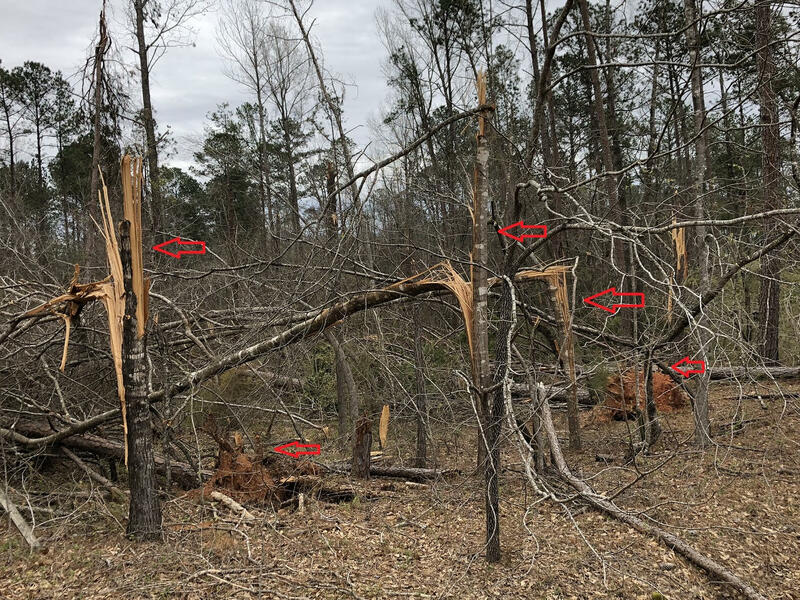 In fact in surveys of marginal events it'd usually be distance of debris carried (with tornado vertical component versus straight line wind's lack thereof) rather than twisting that would help classify the event; usually have to have a tornado to carry heavy tree debris any distance. That said, certainly a lot of twisting in a tornado path when wind rapidly shifts direction as it passes. It's just highly complex. 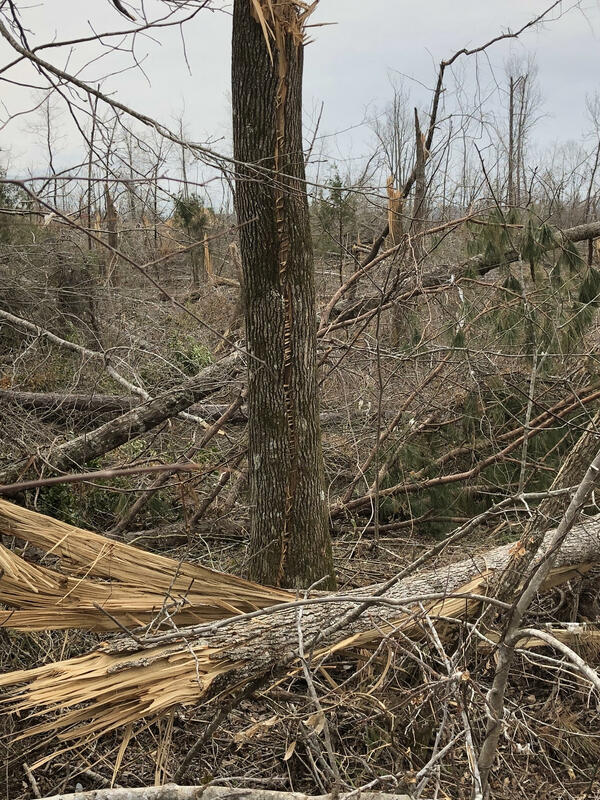 There are a few home videos on Youtube that show pine woods in a yard as a tornado passes and the treefall pattern is bizarre and sporadic as winds shift in complicated directions. I would imagine trees still standing but so heavily leaning would probably indicate the trunk structural integrity and perhaps even roots would have been partially compromised but not totally destroyed by the acceleration, strength, and directional changes of the wind... but I'm no expert. I've always been of the opinion that snapped and splintered trees would imply a much sharper and rapid acceleration of wind, as a longer duration would probably lead to roots having more time to loosen and fail; sharp acceleration would cause the trunk to fail before foliage would shear off or roots would weaken. Trees with weaker trunks or rot could still snap in lower or long duration wind, but compare large-scale uprooting in weaker tropical landfalls (plus snapping of pines and weaker trees) versus snapped and shredded forests of any/all kinds from storms such as Andrew and Michael with rapid eyewall wind aceleration and much higher top speeds.